Innate Choice D-Sufficiency drops represent the world’s premier Vitamin D supplement. D-Sufficiency drops contain Vitamin D from lanolin delivered in healthy olive oil. D-Sufficiency is certified contaminant free and free of harmful preservatives. D-Sufficiency was the first Vitamin D supplement delivered in healthy olive oil; a healthy, naturally occurring, genetically congruent food. 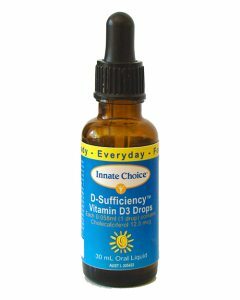 Innate Choice D-Sufficiency drops are the purest, safest, most natural sources of Vitamin D drops available.